Living rooms are likely to be aglow across north Belfast throughout the early hours of Sunday, as many residents stay glued to their televisions to watch live coverage of Carl Frampton’s latest bout. The north Belfast native’s fight against Leo Santa Cruz will be taking place on Saturday night in New York, but the time difference will means that it will be just after 4am the following day when it is screened in the UK. With fairly deep pockets required to cross the Atlantic and watch the fight in person, a number of Belfast residents have said they plan to catch this pre-dawn live broadcast instead as they cheer on the 29-year-old Tiger’s Bay man. 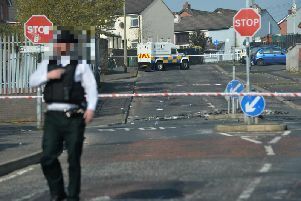 North Belfast man Stephen King, 51-year-old owner of North Belfast Spring Works in Tiger’s Bay, said: “We will be watching it on TV. It’s on at 4am, but we don’t miss any of his fights. Asked if Carl may feel less support in the ring since so many of his fans cannot travel to this fight, he said: “I’d say there’d be a lot of Irish people in America who would support him; a lot of American-Irish people. Also planning to stay up to watch the fight is fellow north Belfast man Maurice Cupples, owner of butcher’s shop Quality Meats on North Queen Street. The 50-year-old said: “His mum was saying to me last week she was just looking forward to going. She can’t wait. “There are people going – I was just talking to a few people and it was £850 for flights I think, and to stay somewhere for two nights. Then there’s tickets on top of that. Despite the timing of the fight, he expects “there will be a good lot of parties going on” in Tiger’s Bay. Mr Cowden, also from north Belfast, added: “Everybody’s very excited, and I suppose a wee bit nervous as to what’s going to happen. “But I think everybody is quietly confident he’ll win. He suggested that a “homecoming” celebration could even be held at Crusaders FC’s Seaview ground just to the north of the neighbourhood. Frampton aims to take the Super WBA World Featherweight Title from Mexican Santa Cruz. The fight can be watched only on Box Nation online, or via Sky’s channel 437 and Virgin’s channel 546.